Sponsors: The Opening Event was generously sponsored by BB&T; Berger Singerman LLP; Boca Raton Regional Hospital Foundation; CBIZ MHM, LLC; Hawk-Eye Management, Inc.; Hotwire Communications; Gerson, Preston, Klein, Lips, Eisenberg and Gelber PA; Lesser Lesser Landy & Smith, PLLC; and Virgin Printing Corp. In-kind Sponsors: Southern Glazer Wine & Spirits, NRGized Media and Zebedee Productions. Exclusive Magazine Sponsor: The Boca Raton Observer. Media Sponsors: ESPN WEST PALM and WLRN Public Media. Event highlights: Nearly 600 Jewish Federation of South Palm Beach County supporters from across the full spectrum of the vibrant local Jewish community came together at their annual “The Opening Event.” From diverse synagogues, schools, neighborhoods and agencies, they gathered at Boca West Country Club on November 14, 2018 to celebrate all the good they do together and get even more inspired to do even more for those who depend on them from down the street to across the globe. 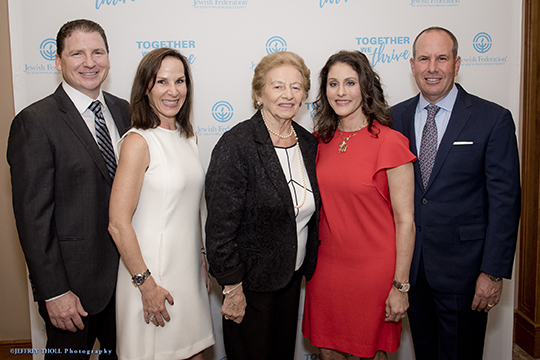 Four compelling video and live stories of people whose lives have been transformed through the guests’ compassion and generosity moved them to tears and standing ovations: Ryszarda, a widowed Holocaust survivor able to remain at home in Delray Beach; Sarah, a young victim of anti-Semitism in France, now thriving in Israel; Hodel, a soldier who used his recovery from severe roadside bomb injuries in Israel to develop a fitness program for people with autism; and Sean, a young local man with autism who has fulfilled his dream of becoming a baker – and whose efforts were thoroughly enjoyed by the crowd through the cookies on the dessert platter. The guest speaker was Mark Wilf, the new chair of Jewish Federations of North America and a longtime prominent leader, advocate and philanthropist for Jewish welfare and vitality. Wilf is also co- owner and president of the Minnesota Vikings, as well an attorney and principal in Garden Homes, his family’s real estate development business. This remarkable evening ended with live music from the BeatleManiacs. For more information, contact Shirley Gross at 561.852.3182 or ShirleyG@bocafed.org.